Sabal Point is an active adult (55+) luxury condominium residence located on the beautiful Boca Raton beachfront. 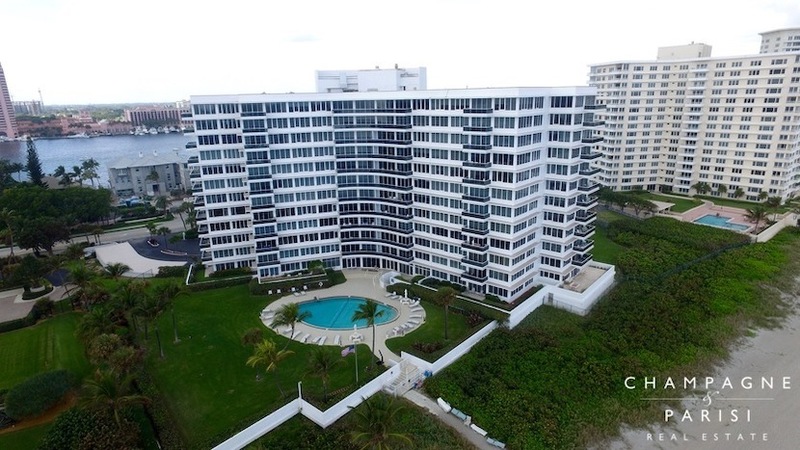 This elegant 12-story oceanfront condominium building is home to just 70 luxurious units. Sabal Point condos offer two- and three-bedroom floorplans that typically range from approximately 1,700 to 3,200 square feet of living space. The condominium residences at Sabal Point boast oversized balconies offering spectacular unobstructed views of the Atlantic Ocean, Intracoastal Waterway, and Lake Boca Raton, with some units offering ocean views from every room. Each condo features a private foyer entrance, spacious open floor plan, double master suites, and in-unit washers and dryers. Many Sabal Point residences have been updated to include many fine appointments such as hurricane impact glass windows and sliding doors, imported marble flooring, and elaborate crown moldings and coffered ceilings. Originally built in 1965, Sabal Point recently underwent extensive renovations to the entire building. Renovations included complete concrete restoration of the building exterior, installation of a new roof, and remodeling of the building interior, including a new and impressive lobby entrance with high-end designer finishes, new carpeting in hallways, and the addition of a new exercise room with state-of-the-art equipment. This active community also hosts numerous events throughout the year which foster a friendly atmosphere and sense of community at Sabal Point, including monthly catered social events. Sabal Point is located at 700 S Ocean Blvd (A1A), just south of Palmetto Park Road in Boca Raton, FL. This oceanfront community is neighbored by similar luxury condominium residences such as Sabal Shores and Sabal Ridge, and is just minutes from some of the most popular area attractions. Sabal Point is close to several of Boca's parks, Downtown Boca Raton, Mizner Park, and The Boca Museum of Art, as well as some of the best shopping, dining, and entertainment options in the area. If you would like to learn more about Sabal Point condos for sale or any other oceanfront condominiums in Boca Raton, please call us today at (561) 235-7800. You may also reach us by completing the brief online contact form provided below and one of our luxury condominium specialists will be in touch to assist you. We at Champagne & Parisi Real Estate are committed to providing the highest level of service and customer care when helping our clients reach their real estate goals, and we would be delighted to assist you in finding the Boca Raton condo of your dreams! Also, please consider registering for a free account which will enable you to receive automatic email notifications when new condos that meet your specific criteria hit the market.